They’re looking for the “greatest mind in technology”, and that’s you. I was intrigued, so I checked out the posting online. The job was an IT position for a growing local company. I love their products and I know others that work for them. The job would allow me the flexibility to work partially from home and to work with a great group of people who truly love what they do. “Maybe it’s really time for a change.” I thought to myself. After all, the stress of being an educator in the current political climate of Michigan has been overwhelming. More than once in the past couple years I’ve discussed with Mr. Hippie, a colleague, or just a friend the possibility of doing something less stressful, less heartbreaking and probably more lucrative. I continued through the job posting. As in most job postings, there were many skills that candidates should have. I looked through the list and was surprised that most were things I had experience in. Unfortunately, there were several that I didn’t and couldn’t fake my way through even if I tried. So, I gave up the idea of a career change. But I didn’t. The idea has lingered with me ever since. I’ve talked to the friends that work at the company about the job. It’s since been filled, but could become available again. Even if it doesn’t, similar jobs are available all the time in other great companies. So, I researched the skills that were missing from my resume. They would take some time to learn, but it wouldn’t be impossible. So, I started teaching myself code. Simple code, but code nonetheless. I started at Khan Academy and in the process got addicted to their “World of Math”. I stayed up most of Thanksgiving night solving complex math problems I haven’t seen since college and still stop and do math almost every day for a few minutes. It keeps my brain young, right? But I digress. Code. Kids can learn it. I want to learn it. I need to learn it. 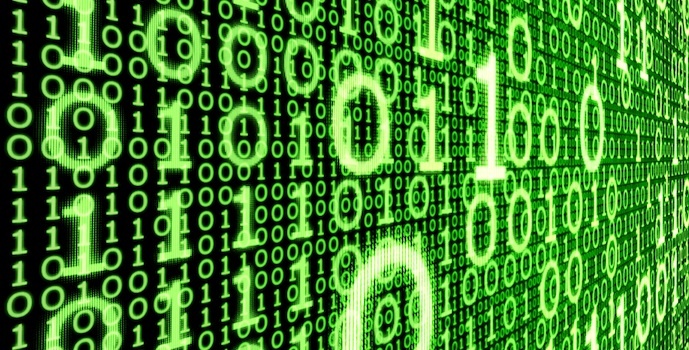 Even if I don’t take a technology job, it intrigues me and opens doors that for now, are closed. Khan is a start, but I’ll need to know more. My friend Liz posted this link to FaceBook: Harvard edx. I followed it. I signed up. And now, I’m really going to learn code. I’ve always been cheap frugal, but my frugality ebbs and flows with my mood, our finances and the needs of my family. I don’t buy myself new clothes except for the occasional pair of tights, knee-highs or other derby wear. We’ve been driving the same used car for as long as I can remember. We buy in bulk and make our own as often as possible.We shop resale. Despite my cheap ways, it seems like we never get ahead. Over the past 19 years, hubby and I have accrued debt. Mortgage debt, student debt and unfortunately, credit card debt. We’ve been working on paying things down, but life happens. Three years ago hubby got down-sized. He was unemployed for four months before he finally got a job cooking at the restaurant he left to work construction. The pay cut was significant. He’s had raises since, but he’s still not up to his construction salary and his hours fluctuate based on business. As a school teacher, I make a decent salary. My health insurance is very good and I get time off in the summer. This isn’t a rant about all the things teachers do in their “time off” or the current politics of education, so I’ll spare you the details, but my salary has been frozen for several years while the costs of my healthcare and retirement have gone up. I’m taking home less now than I was three years ago. So, with costs rising and our salaries stagnant, what do we do? I’m working on some extra sources of income but I don’t have enough time for a steady part-time job during the school-year. I’m trying to find ways to get paid to do what I love. Along with the required continuing education I have to take to maintain my teaching certification, I’ve started learning new computer skills so that I can try some technology jobs from home. My etsy site is going to have some new items soon including some hand-knit & crocheted baby hats. None of these things will make me wealthy, but maybe they can make ends meet. In the meantime, it’s time to tighten the belts again. We’re turning the heat down some more and wearing more layers. I’ve gone back to planning a menu for the week so that we’re not frantic at dinner time buying something to cook. We’re eating out of the freezer instead of filling it. We have a deposit on a whole hog from Quartz Farm to save money on our meat and we’re still raising rabbits. We’re trying new recipes, and eating lots of soup. Homemade soup is a super cost-effective way to eat. I can use up all the leftovers in the fridge along with a low-cost grain like rice, barley or pasta and make a healthy, cost-effective meal for my family. Tonight we had white bean and sausage with a side of cornbread. Have you ever heard the story of Stone Soup? It’s an old folk story in which hungry strangers persuade local people of a town to give them food. 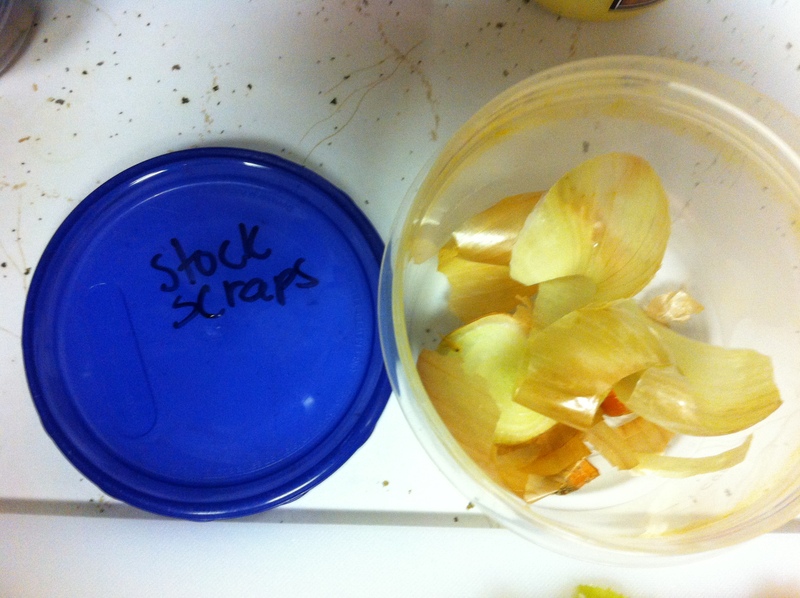 If you check most any soup recipe, you’ll find that it starts with stock. Homemade stock isn’t exactly like Stone Soup, but basically you start with nothing, add a bunch of stuff you were going to throw away anyway and cook it util it’s useful. Stock doesn’t cost that much, but at $2 a quart, it adds up. Especially if you’re having soup more than once or twice a week. 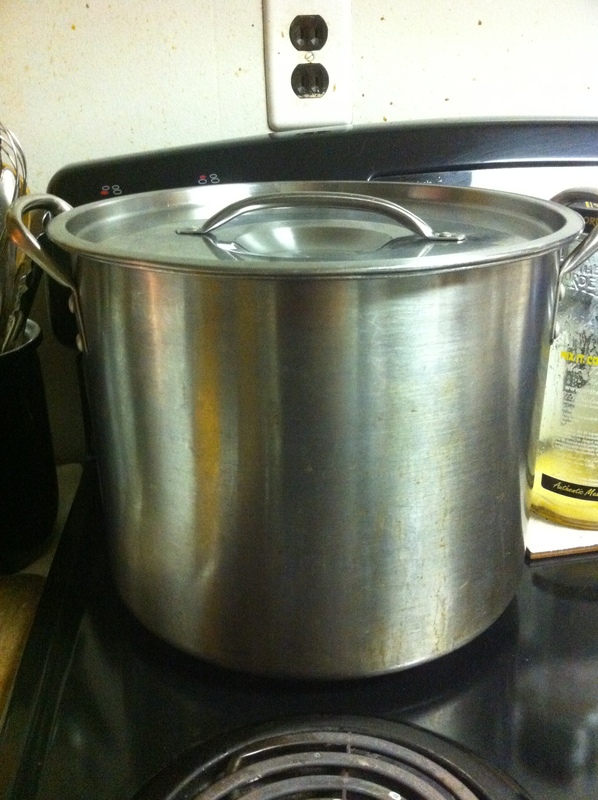 If you’re making a gallon of soup a week, homemade stock can save you $4 or more a week. We’ve been making our own for years and we’re pretty efficient at it. 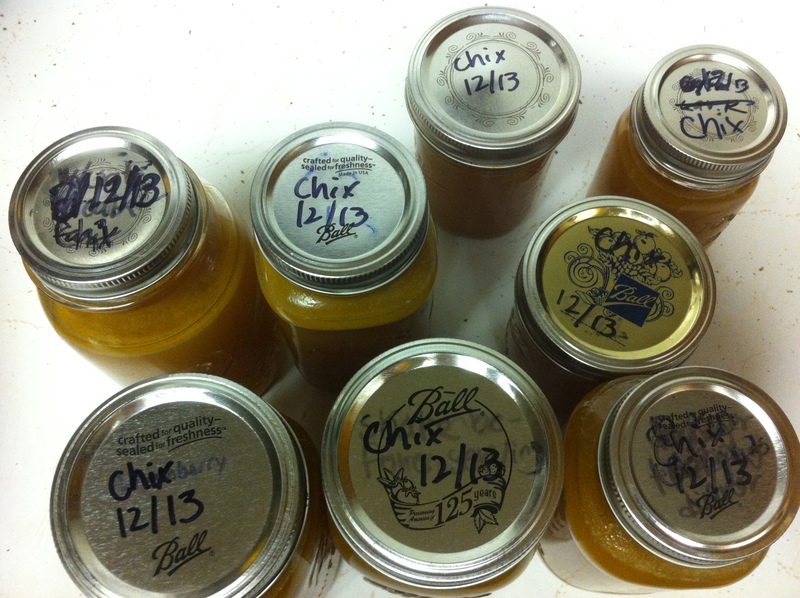 Sometimes we make ham stock, but most often we make chicken stock. I keep a few old five-quart ice cream pails kicking around the cupboard for storage. Whenever we cook chicken, we put the bones into a pail and keep them in the freezer until we get two-or three full pails. Usually, we cook whole chickens, and add the carcasses and all the drippings to the bucket but when we have chicken pieces, Mr. Hippie bones the chicken before it’s cooked and those bones go into the bucket as well. When I’m being really frugal, I save the ends of carrots, onions and celery in a freezer container too. Onion skins add a really nice color to your stocks. 2-3 pails of chicken bones, saved in the freezer for as long as it takes you to collect that many bones. 2 carrots, or an equivalent volume of carrot ends and peels saved from whatever other carrot dishes you have prepared recently. The leafy parts of a head of celery along with any ends you want to trim off and throw in. An onion or the tops, bottoms and skins of several onions. Parsley stems or some fresh thyme if you have some handy. Add all the bones and vegetable scraps to a large stock pot. Cover with water and bring to a boil. Reduce heat and simmer all day or overnight. 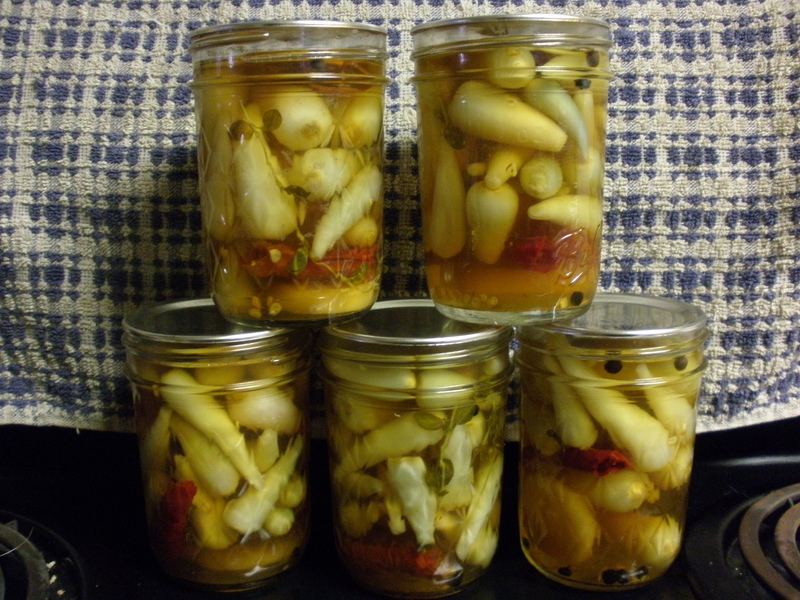 Once the stock has a nice color and flavor, remove it from the heat and strain it into jars. Leave head-space so that the jars can be frozen until you are ready to make your own soup or gravy. Make sure to label and date the jars so you know what it is and which jars to use first. By now you probably know that I make my own laundry soap and fabric softener, “fabric freshener”/ bug spray, dishwasher soap, toothpaste and even, on occasion, bar soap. Pretty granola, huh? Well, today I stumbled upon tooth soap. Yuck, right? Maybe not. 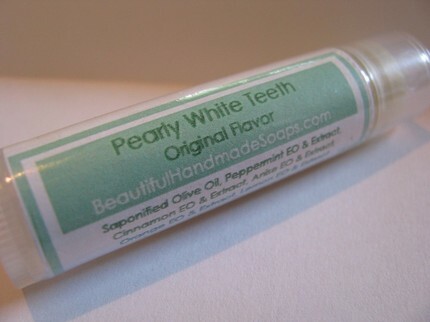 Ambre at We Are of the Day is giving away this tooth soap from Beautiful Soaps. All natural and free of SLS. It can’t kill me, and it’s better than all the poison nastiness that is commercial toothpaste, so I decided to enter. You should too. Really. Go now. Not game for tooth soap? She’s also giving away lip balm and bar soap. Everyone loves free soap, right? Some of the soaps are pretty amazing. Actually, I may just be inspired enough to go whip up a batch myself. I’ll keep you posted. 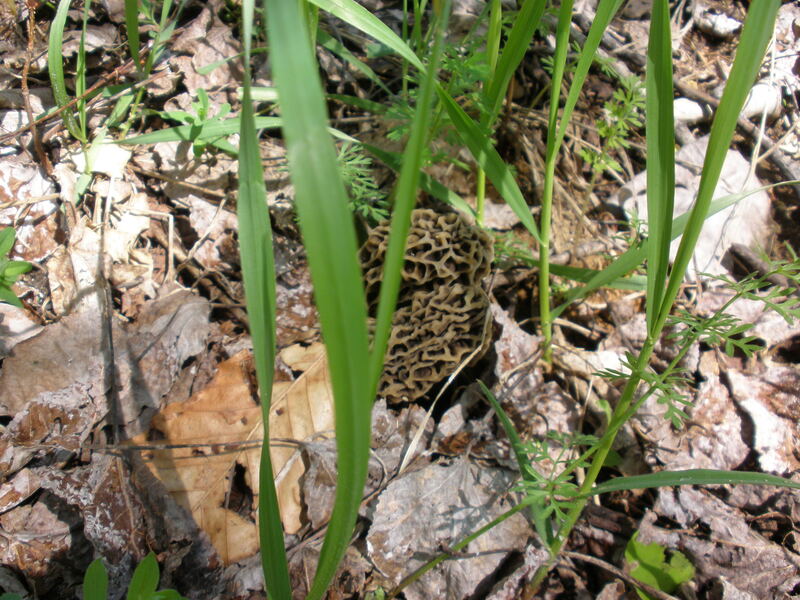 So hubby beat me to the punch on the first morels this year, but we went out again this morning. At last! My first morels of the season. Even close up they hide well. 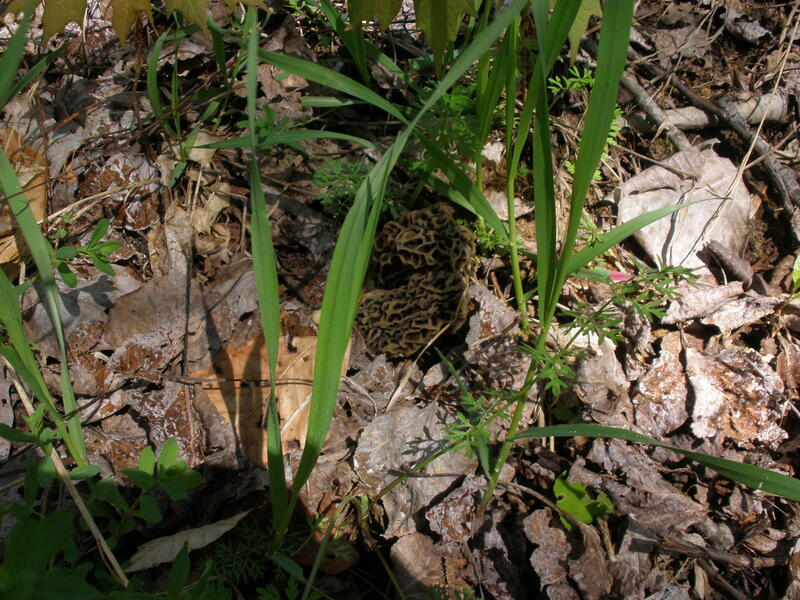 It takes a while for your eyes to adjust to the ground cover, but it’s worth the time spent. Here are the same mushrooms in my hand for size comparison. Nice variety of mushrooms from the same general area. The big whites are just starting to appear. Hopefully I can get out again soon. 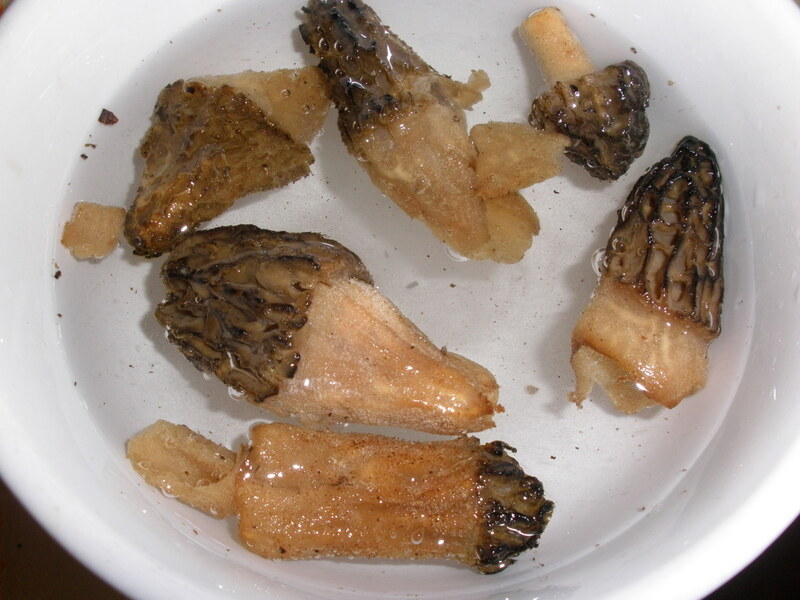 During the Dark Days dinner challenge, I wrote a post called Morel Madness. It included some of last year’s mushroom harvest. 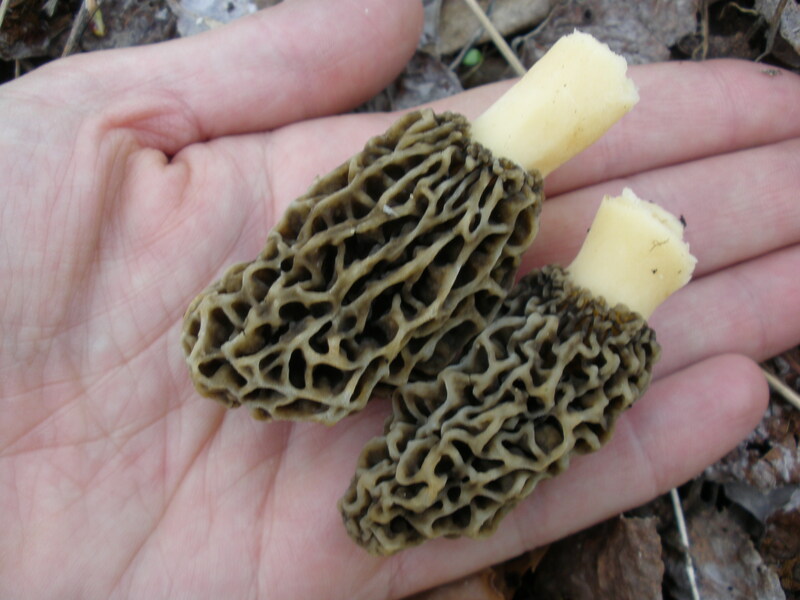 If you’re not familiar with them, morels are highly prized mushrooms. 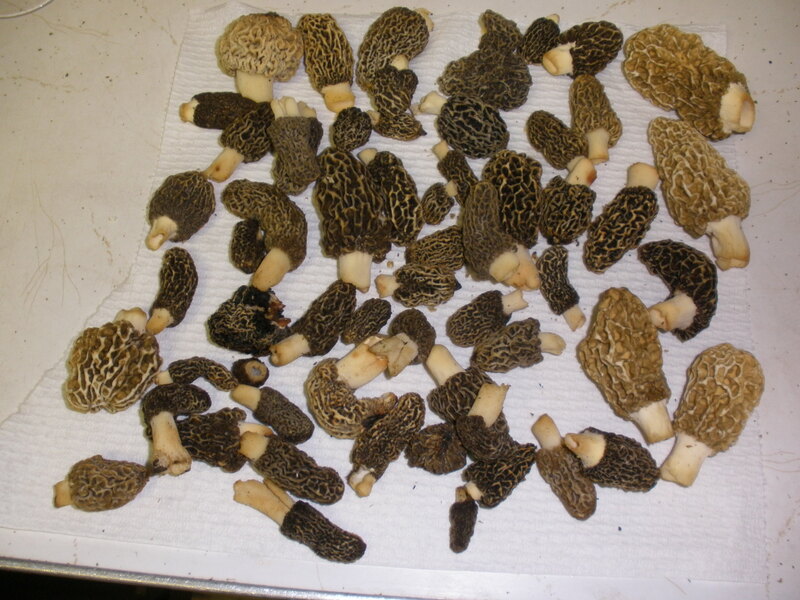 Although I recently saw a half pint of fresh morels at the grocery store for $15, dried morels online range from $10-$20 an ounce. Around here, morels are a pretty big deal. Traverse City might be the Cherry Capital, but Mesick is the Mushroom Capital. First 'shrooms of the season. Some people will tell you not to soak your mushrooms, but take my advice: soak your mushrooms. Last year I didn’t soak some of my mushrooms right away and the bugs that were in them consumed a good portion of the mushrooms. I didn’t spend all that time finding them so that the bugs could eat them. I put the mushrooms in a bowl, salt them liberally and fill the bowl with water. It chases the bugs out. 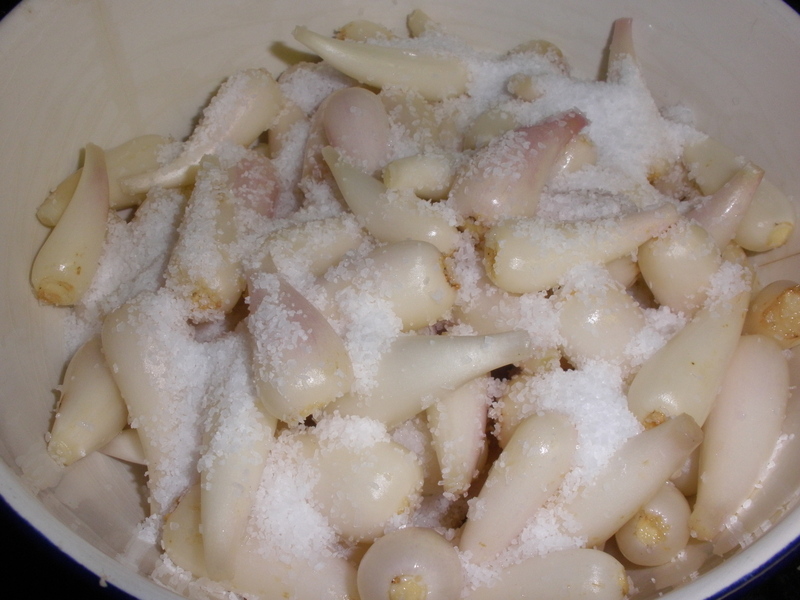 Let them soak an hour or so, drain them and cook them or dry them to use in the future. All summer I’d been shopping at the Farmers’ Market. 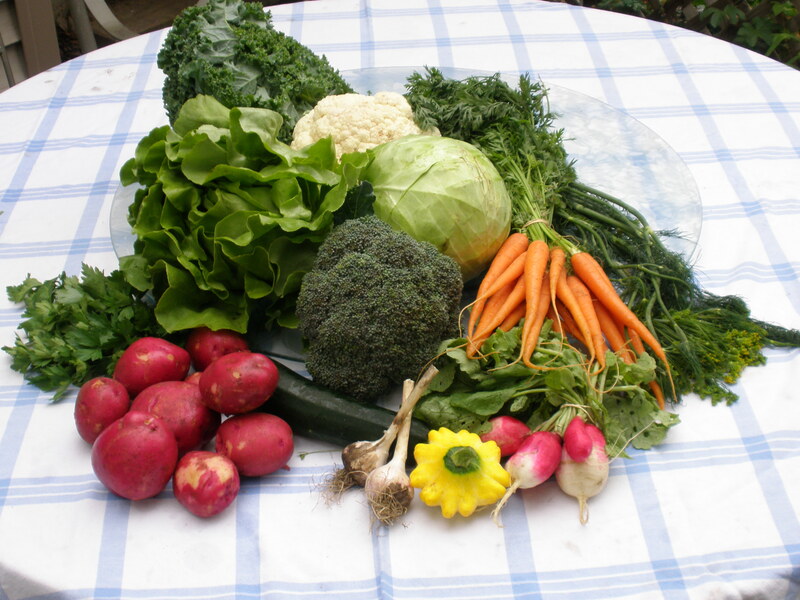 I picked up my CSA box every Saturday morning and supplemented the box with extra carrots, tomatoes, fruits and whatever else I wanted as it came into season. I bought peaches, cherries, blueberries and plums when they were in season and I started buying apples in August when the early apples started ripening. I have particular farmers that I prefer for particular crops just as you may prefer Heinz ketchup over Del Monte. My peaches, plums and apples always come from the same place: Tom Brodhagen at Maple Ridge Orchards in Honor, Michigan. Tom is knowledgeable about his apples and can tell me how long an apple will hold when it is properly stored, how to properly store said apple, and which types of apples are best for which purposes. He is also environmentally certified and limits his use of toxic chemicals which is important to me. Plus, when the last week for peaches rolled around and I only had $5 left in my pocket, he let me owe him the difference for the 1/2 bushel I wanted until the next week. Building relationships with the people who grow my food is important to me. He knows I won’t screw him over on a half bushel of peaches and I know he won’t screw me over on price, quality or any other aspect of my produce. 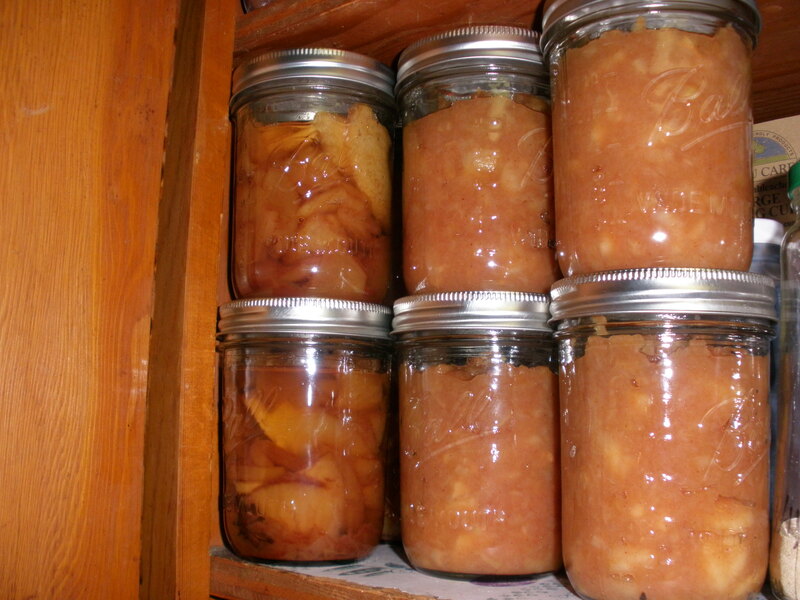 I started my love affair with apples by canning quart jars of Gravenstein Apple Pie Filling in August. As other apples came into season, I flirted with them too. A half-peck or three at a time I would load them into my wagon and roll them home. As Honeycrisp apples came into season a half-peck or a peck of apples wasn’t enough anymore; I caught my daughter packing four Honeycrisps into her backpack for lunch and snacks at school one morning and decided drastic measures were required. I brought home my first half-bushel the next weekend. (Plus a 1/2 peck of Honeycrisp safely hidden away from the eyes of young Gwendolyn.) Gwen didn’t finish the half-bushel of apples that week, but I brought another home the next Saturday anyway. One weekend, when putting away camping equipment, I found two boxes full of canning jars and, my long-lost dehydrator that had been stored in the garage since we moved in 1998. A whole new world of possibilities was opened to me! With the discovery of the dehydrator and 24 more canning jars, apples became something not just to store and have on hand for the winter, but an ingredient to be processed into a final product. 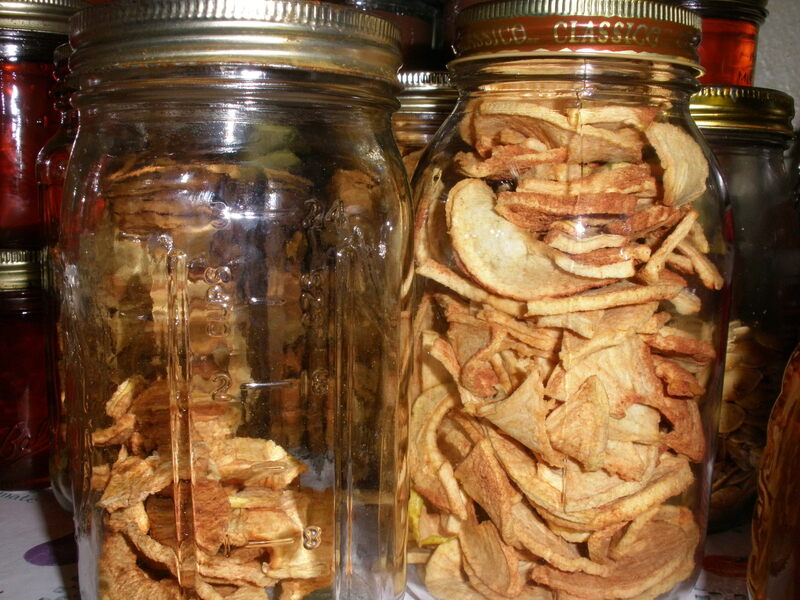 I started dehydrating apples and bought a 1/2 bushel specifically for that. I wanted to make sauce so bought a 1/2 bushel for that. Gwen was still eating apples, so I bought a half bushel for that. Every week I brought home more apples. Delicious dried apples all shrunk down. I started running the dehydrator about four days a week and day and night on the weekends. Eight to twelve apples fit nicely into the four drying trays. 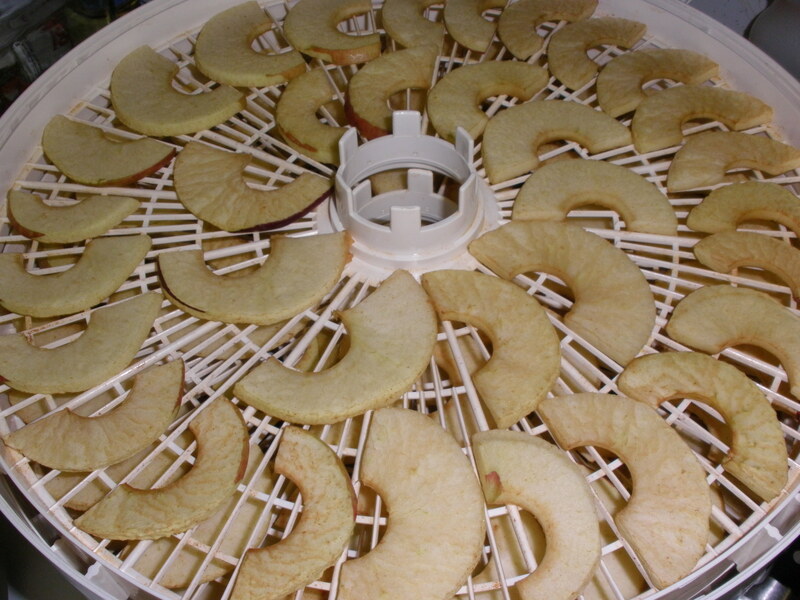 Six to eight hours later, the apples were dry and the dehydrator was ready to reload. Plus, the dozen or so apples now fit nicely into a quart jar. The downside? Those apples that took me only a few minutes to process but seven hours to dry are consumed by the kids and the hubby in five or ten minutes!! “They’re like candy!” My husband proclaims as he finishes off another jar. I can’t seem to dry them as fast as they eat them. I shouldn’t complain; at least it isn’t candy. Well, the Downtown Farmers’ Market ended on Halloween. I didn’t know who would be heading to the Mercato for the Winter Market, so I stocked up on things I knew I would need. I picked up a third 50-lb bag of potatoes, a cabbage to make into kraut, a quart of purple potatoes to use as seed potatoes and . . . Two more bushels of apples. I started with a bushel of Braeburns for drying because my Jonagolds were nearly gone, added a half-bushel of Spy apples for pies and cooking, and rounded out my purchase with a half-bushel of Empires for general eating. I started making apple chips and apple sauce and even tried spiced apple rings. Apple rings and chunky apple sauce~can't wait to try the special jar of Chai-Spiced Apple Rings! The link will take you to the recipe, but I always add more cinnamon. I added about double what it called for and added a whole cinnamon stick to most of the jars. In one of the jars I added some cardamom, a star anise, a cinnamon stick and a few peppercorns. I’m hoping it will have a chai-spiced flavor but I didn’t simmer the extra spices in the syrup so I’m not sure how strongly flavored they will be. It was an experiment, but if they turn out, I think I’ll do a whole batch and simmer the spices in the syrup so the flavors can intensify. 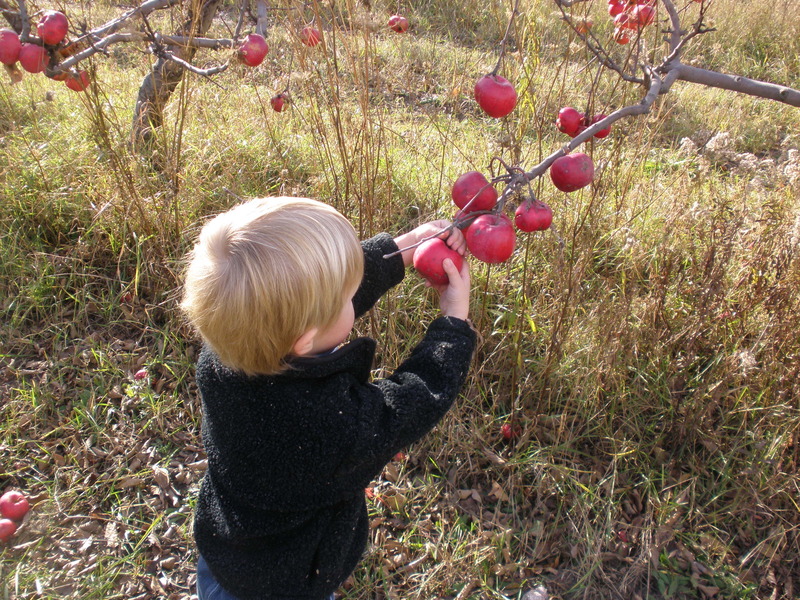 Two weeks later when I decided to take my road trip to Frankfort with Angie and the kids, I still had over a bushel of apples left. What was my husband going to think when I came home with more apples? Nothing. After almost fifteen years, he’s used to my insane whims. When I returned from the orchard with a cooler full of organic apples plus an extra half bushel, I unloaded my bounty into the back porch and began to surmise the situation. I had a lot of apples all of a sudden. It was Friday and I had all weekend so I started a batch of chunky, Ida Red apple sauce from the freshly-picked apples and peeled the rest of the Braeburn apples from the Farmers’ Market to load into the dehydrator; I filled it three times with those slices over the next day and a half. Remember that Juiceman Junior I told you about this summer? As magical as it is, I hate using it because it is such a pain to clean. But, my son Dylan is no fool and he has a remarkable knack for knowing when to ask for things. The kitchen was already filled with apples and it’s not like we were running low on them, so how could I tell him no? We dragged out the juicer and juiced a handful of Ida Reds. They made the loveliest rose-colored apple juice. 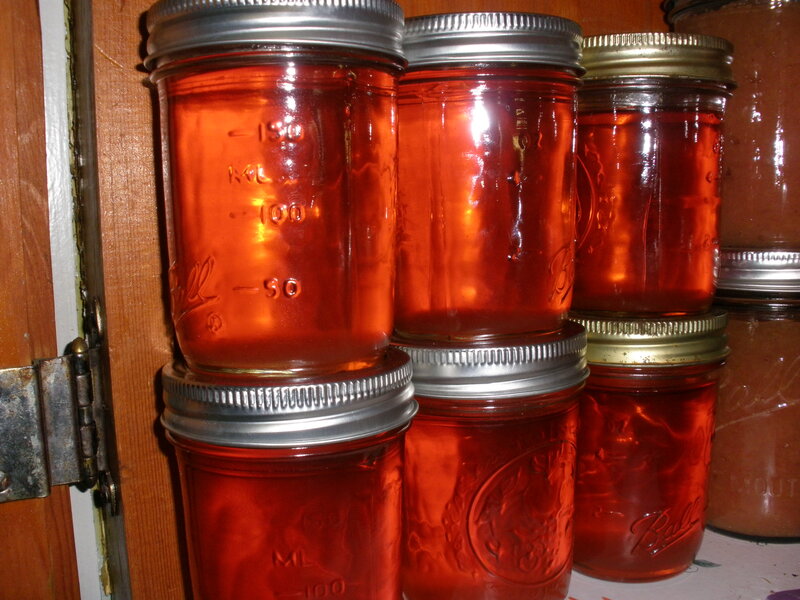 The sight of that lovely apple juice gave me an incredible idea: apple jelly. The world is more lovely through rose-tinted jelly. I washed off a sink-full of Ida Reds and started jucing until I had a full quart of pink apple juice. I brought the juice to a boil, added a package of pectin and five-and-a-half cups of sugar and boiled the whole mess for two minutes. I poured the boiling jelly into hot jars and set them on the counter until the lids popped. The jelly is delcious, but a little thinner than I’d like. For the next batch, I think I’ll decrease the amount of juice a little and add a few drops of cinnamon extract so that it has a nice cinnamon flavor without getting muddied-up with ground cinnamon. I also plan on doing up a batch of little jars; they’ll be great for Christmas. With all those apples in the porch I thought it was time for more apple sauce. Normally I prefer chunky applesauce. It’s super easy if you have one of these handy-dandy peeler/corer/slicer dealies. Pop the apple on the machine, turn the crank a few times and out comes a peeled, sliced and cored apple. It’s so easy an eight-year-old can do it. (But it’s faster if you do it yourself.) 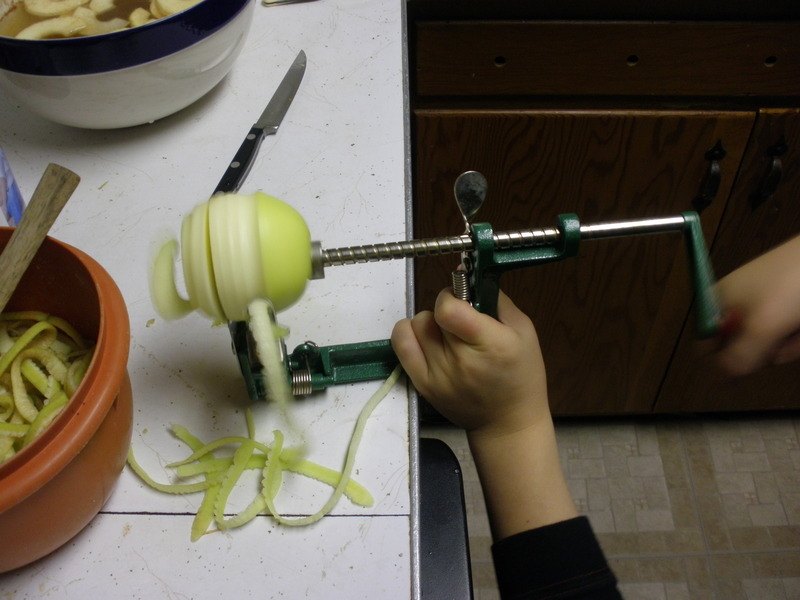 The apple peeler makes all apple products easier. If you cut off the peel-y ends you can throw the whole apple in a pan for sauce. 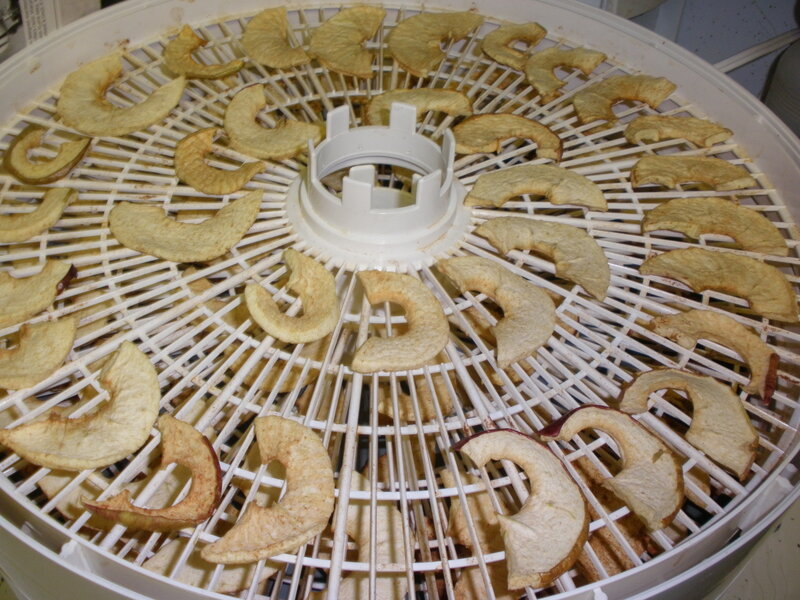 Or, you can cut the “slinky” apple down the center and have perfect slices for the dehydrator or pie. Removing skin is easy with a food mill. But, if you have Ida Red or Empire apples, you might want to leave the skins on so that you can make beautiful pink applesauce. If you have a food mill, smooth applesauce is a breeze. I used the peeler to remove the skins and cores from my apples, but I threw the skins into the pan with the apple slices to make a pretty, pink sauce. 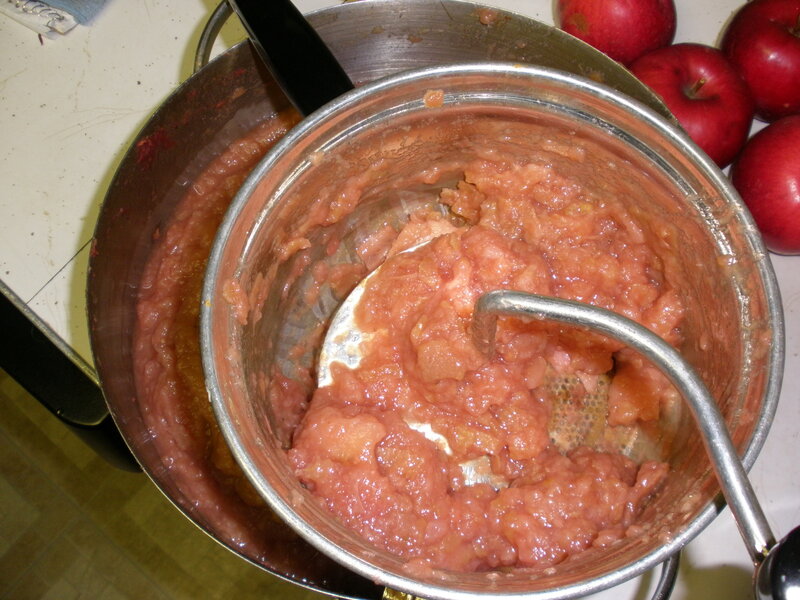 Once the apples had cooked down, I scooped them into the foodmill and pressed the sauce through to remove the skins. 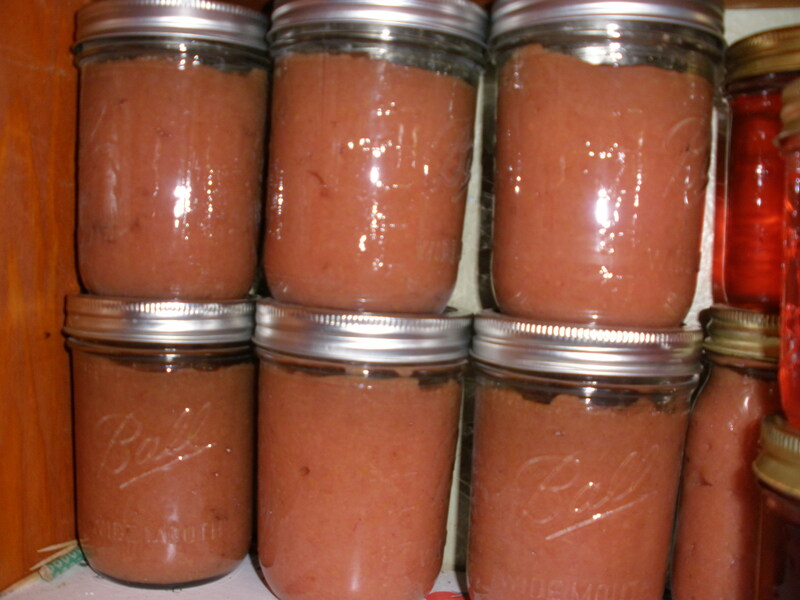 In the picture below you can see the pretty pink applesauce. Unfortunately, the picture doesn’t do it justice! My family has been enjoying the fruits of my labors, but they’re not the only ones. 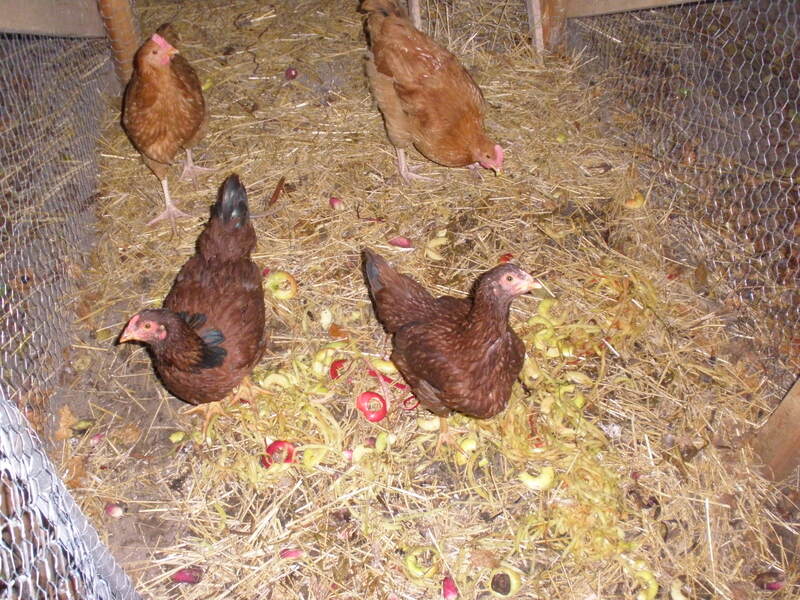 My chickens have only recently decided that compost is a treat. For the longest time they wouldn’t eat any table scraps. I had to throw little wild grapes so that the girls would think they were alive before they would even try them. Finally, after many attempts, a watermelon rind swayed them. Now, they will gladly eat my kitchen scraps. This was good news! While the main reason I got the chickens was to have fresh, free-range eggs, the chickens are part of a larger plan. Chickens are the perfect green machines; they eat my garbage and turn it into nitrogen-rich fertilizer. Girls livin' high on the hog. Now that they understand the joys of compost, they were quite happy to see me bring them not one, not two, but three #10 cans full of apple peels today. Angie and I loaded the kids, some 1/2 bushel bags and two Coleman coolers into the back of her Subaru wagon and started the 45 minute drive to Frankfort to find the Orchard. We talked about school, we talked about food, we talked about kids. We enjoyed the beautiful views of Northern Michigan on a lovely autumn day that seemed more like a late summer day, and we listened to the kids talk, sing, and argue from the back seat. When we finally got to the farm we were amazed by how lovely the trees, bare of leaves and full of fruit, looked. Big J in the orchard picking apples. The farm isn’t insured as a U-pick farm, but as Sarah’s guests we were able to help her pick apples. Each of the kids got a basket lined with a plastic 1/2 bushel bag and Angie and I strapped on the picking harnesses. (I’m sure they have a different name; if you know, please share.) I wish I would have taken a picture of the harness contraptions; they’re really genius. In about an hour we picked over four bushels of Ida Red and Golden Delicious apples between us. Each of us went home with a cooler FULL of apples and I had two, half-filled, half-bushel bags of apples on top of that. It was a wonderful afternoon spent with people I love and Sarah was happy to see the apples being used instead of wasted. Wait ’til you see what I’m doing with all those apples!! I currently have three posts in the works. What am I waiting for? Lots of things. I need to upload pics, finish typing without falling asleep. Various other deterrents. This is important though, and no pictures are required. A friend of mine introduced me to the “Little House in the Suburbs” blog some time ago. (Thank you, Amber.) I am in love with it. So much useful information and things I need to try. Plus now, giveaways. I want to win, but as my husband once said, “My friends deserve nice things.” (Taken completely out of context and that is a whole different story that should be saved for another day never.) So friends, good luck.